He’ll come back as fire. A super fun illustration project for Busy Beaver’s Button-O-Matic Series featuring One Tail at a Time. This black cat was inspired by my own little weirdo, Harmon! “Proceeds of the Paws and Pin-Backs, Busy Beaver's 2018 Button-O-Matic Artist Series will benefit our pawsome friends over at Chicago's One Tail at a Time. This year's series features the purrfect pins from 10 talented artists that you'll go mutts over! Still on the good-side of the dirt. Photo reference from The Library of Congress. Inspired by Japanese Pop-Pysch art and chocolate milk. Love is gross! Show someone you care by giving them one of these icky Valentine's Day cards. Choose one (or both if you really want to make it weird)! "I've got my STYE on you, valentine!" 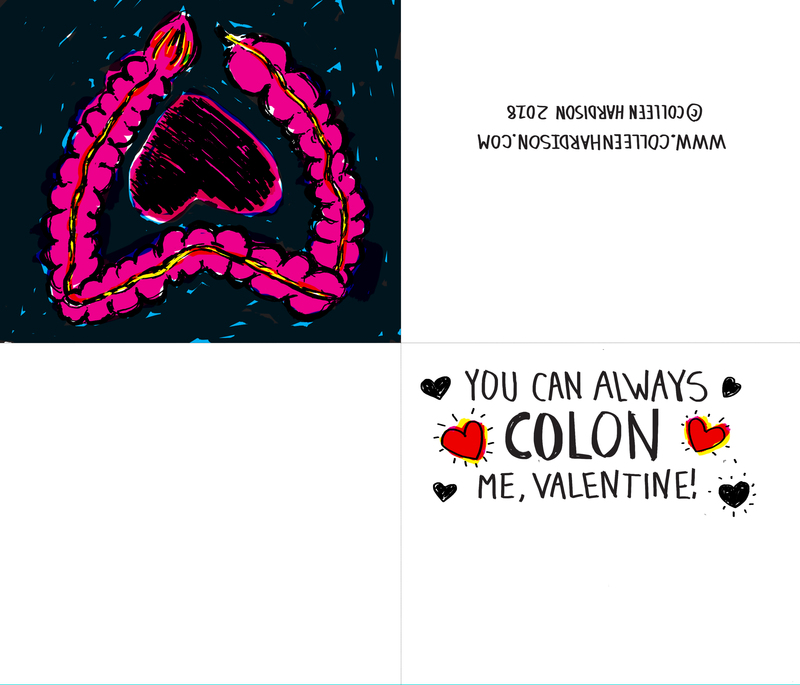 "You can always COLON me, valentine!" Download using the links above and print without borders ("edge to edge") on 8.5" x 11" copy paper, fold long-ways (hot dog) then fold short-ways (hamburger), write in a personal message, and give to friends and loved ones! A piece about the exhaustive performance of being a gal. Promotional poster for WLUW and CHIRP radio sponsored event at Lincoln Hall. A series of self-directed illustrations on addiction and its affect on children. Inspired by the late, great Warren Zevon. Personal project based on the stories found in nefarious folk songs. Personal pattern based on my favorite things: monsters and snacks. Portrait of Mr. Moore in front of his mailboxes. Illustrations promoting WLUW speciality show Staring and the Spotlight. Each show spotlights a record label, genre or theme. An editorial assignment on capital punishment in the United States. Editorial piece on Congress voting to defund Planned Parenthood. When you can work together, you can influence the people on top.